Dermot Looney, a Labour Party candidate in the Tallaght Central ward in June’s local election, has challenged candidates in the election to state where they stand on the issue of water charges. The call comes in light of Minister John Gormley’s claim that the re-introduction of water charges was ‘inevitable.’ The claim was made by the Green Party Minister in a speech to the Academy of Engineering Institute on Tuesday, April 28th. Domestic water rates were scrapped by 1997 (by the Labour Party) and despite hints at reintroduction by Fianna Fáil in the time since, water charges have remained off the agenda. But the latest statement by the Minister for the Environment suggest that working people, already lashed through crises in jobs, public services and the economy as a whole, are again in the line of fire through water taxation. “I oppose the reintroduction of water charges,” Looney said. "So does the Labour Party." 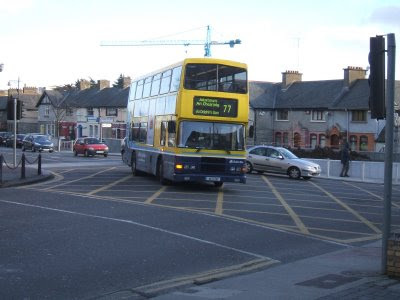 In the past, I have spoken to a number of blog readers from across Dublin 6w, 12 and 24 about bus service changes. The cutbacks in Dublin Bus are an assault on ordinary working people and environmentalist principles. I have campaigned with my Labour colleagues against their implementation but, sadly, today is the day when much of them come into effect. A number of local routes have been withdrawn entirely - including the 15x, 50x, 202 and 206. Service changes to more routes, including the 19a (Jamestown Road to Greenhills) service, will be made on May 10th. I am committed to working as a candidate and, hopefully, a Councillor to bring better bus services to our area. You can read more of my blog posts on transport here and here. I was recently contacted by a local 'paper and asked the following questions. In the end, I had to cut my answers to about a third of what is here, but I thought I'd share my full answers with the readers of this blog. I think it gives a reasonable articulation of my campaign for election here in Tallaght Central. I'll make sure to upload the final article to see how our campaign compares with other candidates'. Why did you decide to run for election? I am involved in politics because I want a radical change for my local community, my country and the world. As a socialist, I believe that the political balance at all levels needs to be shifted away from big business and the powerful, and back to working people and those excluded from society. I believe I can best represent that political viewpoint - and the values to which it aspires - by representing local people at Council level, where so many of the crucial decisions that affect our lives are made. What is your political history? I have been politically active for more than a decade across local, national and international campaigns. I played an active part in the movement against the war in Iraq and have been particularly involved in human rights campaigns for Palestine and Colombia. I have been active in national campaigns against racism and defending our natural resources from multinational control. Most recently, as a primary school teacher, I have led a campaign entitled "Putting Kids First" which has involved schools and parents in fighting against class size increases and special needs cutbacks. Locally, I am leading the campaign for appropriate development at the McHugh's site in Greenhills and successfully worked with local residents to fend off speculative landgrabs in Greenpark. I joined the Labour Party aged 20 in 2003, and was Chair of the UCD Labour Party and National Communications Office of Labour Youth before joining the Greenhills/Willie Cremins Branch. At 26, this the first time I have stood for election - a point I believe is positive, given the fresh ideas and young person's perspective I bring to this election. What changes do you plan on making? I am acutely aware of the limited powers of local Councillors, as well as the need to work with other elected representatives and council officials to enact real changes. Politicians are famous for drawing up wishlists they could never possibly enact. My ideas are fiercely ambitious but grounded in reality. I'm also mindful that much of my immediate priorities will be geared towards defending existing services - fighting cutbacks in local schools, Tallaght Hospital, Dublin Bus and other public services. I want to change the Council's housing policy so that more social homes are built, affordable houses are made truly affordable, and a new "Rent to Buy" scheme is adopted by the Council, under which single people or couples can rent a home from the Council with the option of buying it later on, with that same rent money going to pay off the deposit. I also want the Council to be at the heart of a new jobs policy for our community - making sure existing jobs are kept here, and creating new, sustainable employment for local people. Many of these can be delivered under some of the schemes the Labour Party have outlined such as our "Earn and Learn Scheme," where a person can work 3 days a week and is supported in college for two. Why should people vote for you? Local people are fed up of Fianna Fáil and their disastrous politics. But rather than a change from Fianna Fáil to Fine Gael - from Podge to Rodge - I offer a real alternative. I bring both passion and principle as a young candidate, as well as huge experience in the kind of political campaigns we will need in the time ahead - defending public services, fighting cutbacks and developing communities. There is a fairer, better way to beat the recession, save and create sustainable jobs, and re-energise our local area with community spirit and solidarity - and I want to be at the heart of that as a local Councillor. I thought I'd share the first real video of the campaign with you all. Please leave your comments either here or on Youtube. Enjoy! Some people don't believe we're the youngest local election campaign in Ireland. True, we have some proud support from veteran political campaigners here in Greenhills, chief amongst them Cllr Eamonn Walsh. But pics like these show the major success of our campaign to date - getting dozens of young people active and engaged in politics. I'm pictured, top right, in Perrystown with Colm Lawless, Brian O'Connor and Ciarán Rose on the canvass last week. 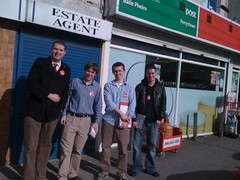 The picture was taken by another canvasser, Kirsten Gordon, who features with the three lads below. Later that evening we had a visit from the DCU Labour Party who are undergoing a resurgence this year. They joined up with some of our regular team for some campaign work in Dublin 12. The picture (taken by Paul Mulville) looks heavenly, not just because it was Holy Week, but moreso because the only lights to illuminate us were the training floodlights used by the Robert Emmets team in the 8 Acres! No matter what way the count goes on June 6th, engaging scores of young people in politics like this will be something to take pride in. Dermot Looney, a Labour Party candidate in the Tallaght Central ward in June’s local elections, has slammed April’s ‘emergency budget,’ saying that it targeted PAYE workers and those on welfare instead of hitting the rich. Looney, 26, said that the budget featured, at its heart, a callous and right-wing political imperative which underlined the failed politics of the Fianna Fáil government. This video was shown at the Labour Conference in Mullingar. It's well-made and well worth a look for anyone interested in a third political alternative for Ireland. 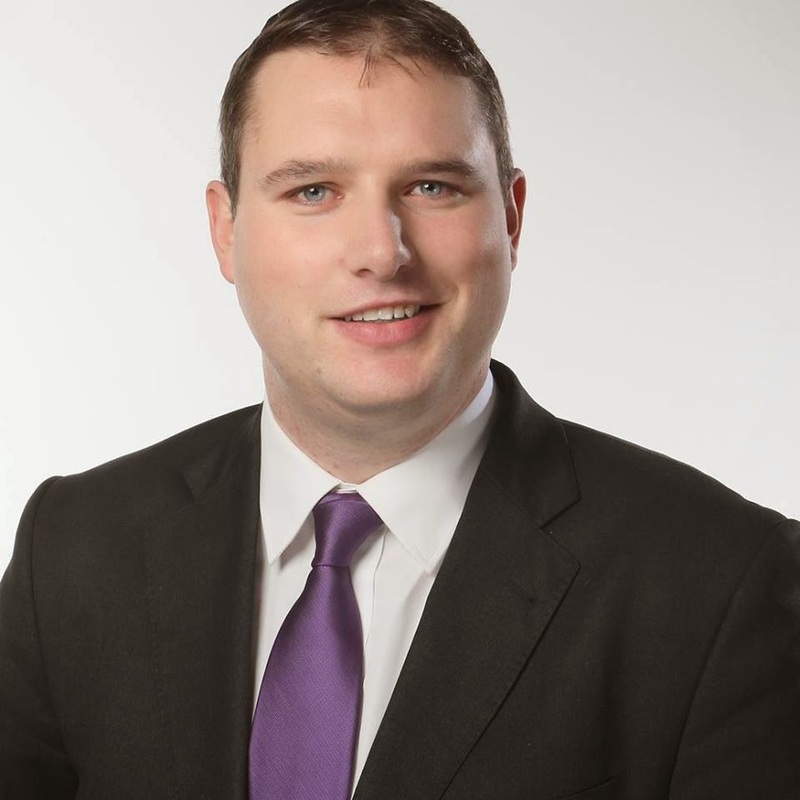 Dermot Looney, the Labour Party candidate for this year’s local election in Tallaght Central, has said that the most recent live register figures for the area highlight a potential “life-long jobs crisis” which will be felt hardest by young people. Looney’s comments come in the wake of March’s live register figures which show a record 8,233 people out of work in Tallaght – with a quarter of those aged under 25. The 26 year-old Labour candidate, who is based in Greenhills and works in Tallaght, has been highlighting youth unemployment as a campaign issue for many months and has said that measures in April’s budget are a double-whammy for young unemployed people. March’s live register figures show an extra 259 people signing on at the Tallaght Social Welfare Office, 83 of whom were under 25. In just 12 months there has been a staggering increase of 3777, or 85%, in the total numbers signing on in Tallaght. The youth rate shows an increase of 947, also 85% up on the figures since last March. However, Looney has said that the Tallaght office shows a much higher rate of youth unemployment than the remainder of the country. Looney also highlighted the sad increases at the Bishop Square Welfare Office, used by people in the Dublin 12 and 6w parts of the Tallaght Central ward. Here, the number of those signing on increased by almost 500 from February to March. Incredibly, there has been a jump in those signing on at Bishop Square in the last 12 months of 95.4%. I'm hoping to blog on today's budget very soon but the fightback against it needs to be strongarmed. 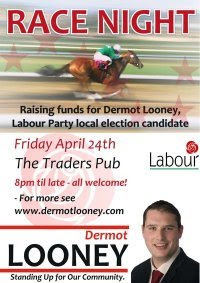 We are holding a Race Night on April 24th to fund the final stages of our campaign. Details are below. Please email me or leave a message here to buy or horse or sponsor a race or ad. Our campaign for community and change in Tallaght Central is now entering the crucial final two months. After more than a year on the road we need to make these last few weeks count. Part of that is strong-arming our campaign to compete with the big money machines of FF and FG. We don't take money from developers, builders or big business. We need it from ordinary people - the kind of people we want to represent, and the people for whom Labour provides real representation. Our Friday Race Night will be great craic. The banter and the bets will be flying! 1. Buy a horse or a few at just a tenner each! 3. Take out an ad in our race night programme - very reasonable rates for great advertisement.